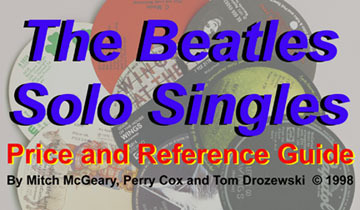 The Beatles as solo artists released more than 150 different singles on vinyl comprising nearly 300 variations, not including promotional copies. The first solo 45 was John's Give Peace A Chance, issued July 7, 1969. George's first 45 was My Sweet Lord issued in 1970, Ringo's was Beaucoups of Blues, also released in 1970, and Paul's was Another Day in 1971. The last solo vinyl issues appeared in 1994 as part of Capitiol's "For Jukeboxes Only" series - Ringo's Wrack My Brain and Paul's Wonderful Christmastime.